It’s time to venture forth and find some fresh sea air! In Trollhalla, you join forces with your fellow trolls to sail the seas in search of islands filled with pillage and plunder. Crunchy livestock, nervous monks, panicked princesses, piles of gold, and casks of grog await you! But watch out for Billy Goats--if you’re not careful they will knock parts of your precious stolen cargo out of your boat! With so many goodies lying about on these islands, it feels like you’ve died and gone to troll heaven, or perhaps someplace even better -- Trollhalla! Trollhalla was a nominee for Best Strategy Game in the Games Magazine "Games 100" for 2012. Great Odin's Goat! A review of Trollhalla at Dice Hate Me. WIRED/Geekdad Review: Quit Playing Bridge and Get to Trollhalla. Here is a review of Trollhalla by The Board Game Family, with video. See a detailed video breakdown and review of Trollhalla by Drakkenstrike in high definition. Here is the "Viking Pigs" Muppet Show clip that helped inspire the game. Read this very nice Deseret News article profiling Trollhalla and its makers. 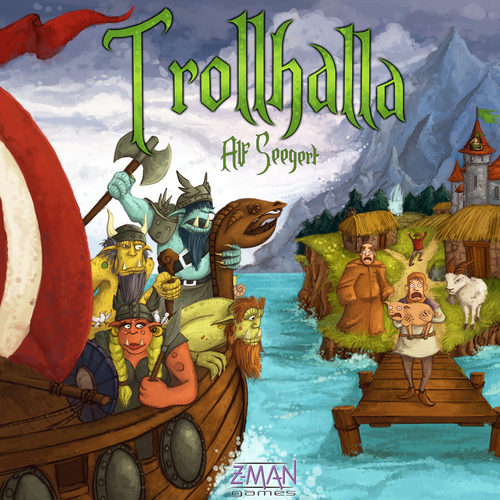 Want to learn how to play Trollhalla? View a video tutorial for Trollhalla here! Read my Board Game News "Designer Diary" on Trollhalla here.